Emma has dark blond hair, tied in bunches with lilac gingham ribbons. She wears a matching ribbon tied as a scarf, and her pretty white dress has navy stripes, pink roses and lilac blossoms. She has lavender shoes with bows, and a lilac flower button on her skirt. 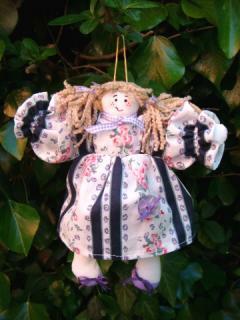 All my Country Fairies are handmade, and individually designed and named. Please note that these are NOT A TOY, and should not be given to children to play with.